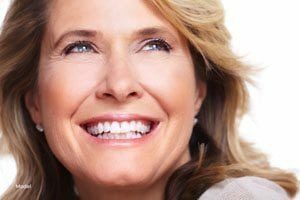 Dental implants are the strongest, most state-of-the-art tooth replacement solution on the market today. When properly cared for, they are built to last an entire lifetime and can withstand the chewy, crunchy food you’d like to eat. Although it’s rare for Pasadena dental implant patients to get infections after having their implants placed, it does happen on occasion. An infection called peri-implantitis may occur, and it’s possible that this infection could spread and grow around and underneath your new dental implants and their titanium roots. What Does Peri-Implantitis Look Like? Peri-implantitis can be quite serious. It occurs when there is swelling and inflammation around the gum and bone surrounding a dental implant that has already begun fusing or has completed fusing with the jawbone. Pasadena patients who get peri-implantitis are at risk for developing jawbone loss, implant instability, and ultimately dental implant failure – meaning your implants may become loose or fall out. After investing so much time and money into your new smile, not to mention the discomfort from having oral surgery to begin with, you can’t afford to lose your dental implants to peri-implantitis. Who’s At Risk for Peri-Implantitis? If you have diabetes, osteoporosis or a compromised immune system, make sure you follow your general practitioner’s instructions for managing your disease. If you notice any increase in symptoms or side effects of your disease, alert your primary care physician immediately. If you’ve had gum disease in the past, make sure you follow proper oral hygiene – even if you have an entire mouthful of dental implants – by brushing twice daily, flossing once a day, rinsing with an antibacterial mouthwash and visiting our doctors every 6 months for a dental check-up. If you smoke or use chewing tobacco, quit now. We know you’ve probably heard this advice a thousand times, but doing so can save your new smile. If you need help quitting smoking, ask our doctors for help enrolling in a smoking cessation program. As always, if you have any questions for our doctors about how to preserve your dental implants for a lifetime and avoid developing peri-implantitis, we want to know. You can call or schedule an appointment at any time to have your questions answered. You can reach us today by contacting our office in Pasadena at (626) 792-3161.